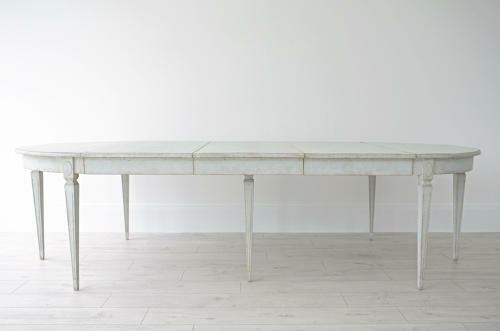 An outstanding early 19th century Gustavian demilune extending dining table with exquisite pale blue patina. Raised on elegant square tapered and fluted legs, with scalloped tops and carved oval motifs. This beautiful antique dining table can be used in one of four flexible configurations; as a round breakfast table seating four adults, or easily extended by one, two or three extension leaves for a maximum length of 300cm, and seating 10 adults in comfort. Swedish circa 1820. Restored.